SuperFogeys - IT’S A WAR–IN THE STARS!!! I broke it down for you in the title of this post. It’s a war–in the stars! Imagine seeing that title for the very first time in 1977, before you knew anything else about the movie. You’d laugh. You’d just have to laugh. It’s Snakes on a Plane obvious. It’s a title and a plot summary all in one. Try applying that title logic to other films and see how far you get before cracking up. The Godfather? Mob Wars. Citizen Kane? Man Rich and Sad. Lawrence of Arabia? White Man Saves Dark Men. Armageddon? Michael Bay Makes You Cry and Hate Yourself for Being a Sap. I take it back. Star Wars is not a stupid title at all. It’s just good ol’ truth in advertising. With the release of the entire Star Wars saga (And it really does get to be called a “saga”–which is defined as a “cross-generational story” Sorry, Twilight. You don’t count. Stop trying.) on Blu-ray next week, I’ve been thinking a lot lately about how my relationship with Star Wars has changed over the years and why in the world I put $100 down on a movie series I’ve already purchased at least three times. My earliest Star Wars memory? Begging my father to leave the theater because Empire Strikes Back was too scary. I was 3-years old. That’s my first memory–a negative one. I was born the year A New Hope came out, so I didn’t see it in the theater, only on VHS. My favorite Star Wars movie has always been Return of the Jedi, which, I know, is blasphemy. I mean, Ewoks. But I saw Jedi five times in the theater in 1983. And my dad took me each and every time, the last after I’d been stung by a bee on my thumb. I’m allergic to bees. We sat, in order from left to right–my dad, me, and my giant thumb on a pillow in the seat next to me. For those two and a half hours, it didn’t hurt. Flash forward to 1997 and the Special Editions come out. I’m on a mission, so I can’t see ‘em. So, no, I’ve never, ever seen A New Hope on the big screen. I get home a year later and I see the weird new stuff, but it’s still Star Wars. You all know what happened after that with the prequels and the disappointment that was. It seemed the older I got, the younger Star Wars got. I guess that makes sense when you’re talking about a space adventure aimed at kids, but the prequels aged me faster than necessary. By which I mean, Jar Jar. So, I kind of fell out of love with Star Wars. A lot of us did. There’s still a lot to like there and I will always think the aesthetic of it is BRILLIANT (I even own a custom made storm trooper suit–good luck telling me apart from the real deal when I wear it), but the bloom is off the onion at this point. And still I pre-ordered the Blu-rays to the tune of $100. (Mind you, it was $100 entirely financed by the sale of a bunch of my old DVDs–I’m neither rich nor loco.) And, I think, the simplest explanation as to why is this: my kids. I have three little girls and a couple of them have seen all six movies many times, but it’s been a while. They don’t remember them all that well. And they LOVE Blu-ray as much as I do. (Seriously–Cami, who is six but developmentally delayed, can say all of six words and one of them is “Blu-ray.”) They see with very different eyes than I do and through their eyes I can watch the movies again, fresh. I’ve heard about the changes. The Yoda puppet in The Phantom Menace is gone and replaced with the CGI Yoda (good). A lot of the lightsabers have been color corrected (good), but not all of them (whatever). The Ewoks have pupils and can blink now (fine). Darth Vader says “No. Noooooo! !” before tossing The Emperor (very bad). I can live with all of that. More importantly, my kids aren’t going to care and won’t know it’s any different. They’ll watch the movies in wonder and awe and the new stuff will just fly right by. I wonder if they’ll enjoy the movies. I think they will. I hope they will. Well, then, of course it’s all George Lucas’ fault for adding “Jedi Rocks” and taking away “Yub Nub.” Seriously, never let George Lucas DJ your party. His taste is just the worst. If Tyler ends up getting Star Wars for Christmas or his birthday, it’s because I’m secretly clever at buying him selfish gifts. (Like last year’s Battlestar Galactica. I mean, I wanted to watch it too!) Except, now the secret is out. And as for Return of the Jedi being your favorite, all I have to say is how can you resist those Ewoks?? (No, really.) When I was little I wanted an Ewok SO much. Except, if they have pupils now, I’m not sure they will be as cute. But I’ll have to see them to decide. 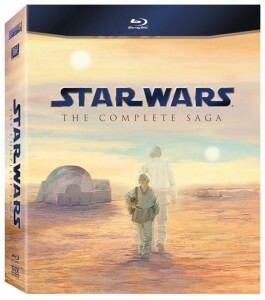 Enjoy your Blu-ray Star Wars! I’ve seen footage of the Ewoks with pupils and it’s mostly pretty subtle. I think you’ll be okay, Karen. Not many love the Ewoks. I don’t really get the hate, personally. They’re not my favorite, but I think they work in the movie just fine. The real problem with Jedi, as I see it, is Han Solo. He’s just not the same guy and his arc is truly, truly weak. I say with pride that I’ve never seen the prequels, and whenever someone watches them on TV I walk out of the room. After all the hype I was so fed up with Star Wars I refused to watch the prequels and when I heard what was done… I was glad. Don’t have kids, but I’d never show ‘em Star Wars unless they asked for it. Not gonna ban the crap but sure not gonna encourage it either. The only movie I DID see on the big screen was “Return of the Jedi”, and I loved the damn e-woks because I was the right age. I think you’re missing out on some great moments by avoiding the prequels altogether (and the chance to make up your own mind, of course–though from what I know of you I doubt highly you would enjoy them), but to each their own. Having kids make a HUGE difference in your ability to enjoy certain things. I have the VHS re-release boxed up somewhere. It’s the closest to what I remember watching as a kid and I hope to keep it that way. Part of me wants to watch the newest versions and see what changes were made but I don’t want to lose that little kid wonderment. I went and saw Return of the Jedi three times in the theater as a kid. My favorite as well. That I can understand. Although… even though I’m not as high on Star Wars as I once was, I can still remember what it felt like when I was a kid. I can’t really say the prequels or changes have really ruined anything for me. Also, I’m fascinated by George Lucas as someone who just can’t leave well enough alone.